1st Choice is the top choice for plumbing and HVAC service in your neighborhood. 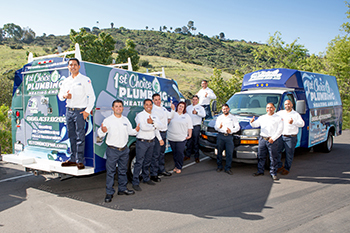 Since 2012, customers throughout San Diego County have come to rely on 1st Choice Plumbing, Heating and Air for friendly service and solutions that work. While we work fast, quality is never compromised. Every service call is designed to provide practical solutions that will help you save more money in the long run. We do this by getting to the root cause of the problem. Only then can we carry out the best solution and make sure your equipment provides reliable and efficient performance. We are a family owned and operated company, and we treat our customers to friendly, personalized service—just like you deserve. You will be greeted by a knowledgeable support specialist when you call, and we will set you up for immediate service. You can expect us to arrive promptly, ready to get to work right away. Your plumbing or HVAC problem will be treated with priority, and we do our best to go above and beyond to ensure your total peace of mind. With us on the job, you never have to wonder just what the technician is doing to your property. Before we begin any work, we will discuss the job with you, providing honest recommendations with options that allow you to choose the best service for your particular situation. We take your needs and your budget into account and only present the most cost-effective services and products. You pay the price we quote and receive the level of quality service you expect. There are never any hidden fees or surcharges for trip fees, overtime, emergency services, or anything else. To learn more about what to expect when you hire 1st Choice Plumbing, Heating and Air, check out our 5-star reviews from past clients for unbiased and unfiltered reactions to our stellar service.